Panini's Timeless Treasures brand is back this year with an immediate noticeable difference... no tin! Yep, gone is the tin that Timeless Treasures came in these past few years. Instead, it offers collectors a sleek new sleeve and 'book-like' opening to get to the pack. Have the changes this year improved Timeless Treasures? Let's take a look at one pack/box and see! The Timeless Treasures base card is a medium-thick card that features serial numbering to 299 and foil stamping. The overall look is that of a framed portrait with the featured player popping out. The base design is simple, perhaps too much so. The border of the card is mostly white with some faded tan/brown mixed in. It really reminds me of an old photograph. 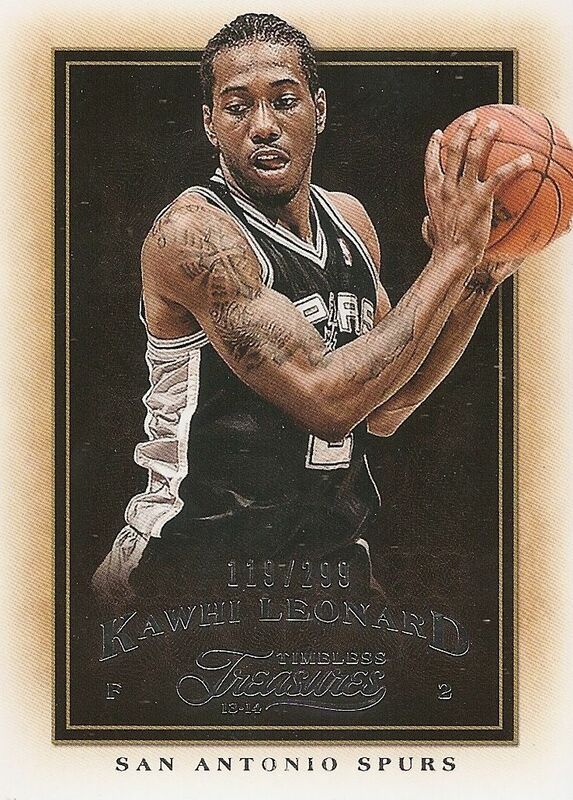 The player is set in an all black background with their name, team, and Timeless Treasures logo at the bottom of the card. While there is nothing inherently bad about the design of the base card, it is not particularly inspiring or exciting. If Panini wanted to really get the framed photo effect, they should have done a bit more to make it look that way. I can't see many collectors raving about these base cards, which is too bad because they have a good low-ish numbering, and are somewhat limited coming in at only one-per-pack. The back of the base card has been nicely done. 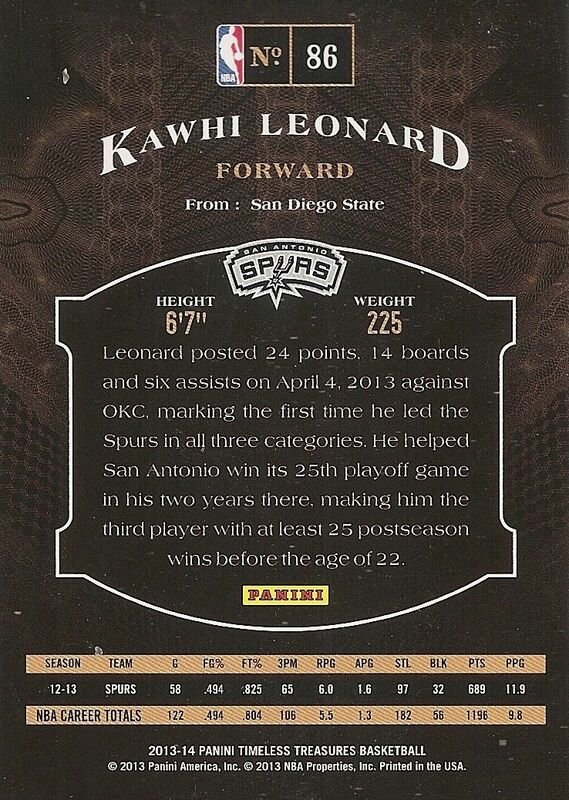 I love the fact that the back of the card is different than many of Panini's other designs. The 'older' or shall I say 'timeless' theme is evoked by the subtle background design. Though the background is somewhat difficult to see, it really does add quite a lot to the look of the card. The color scheme blends nicely together to create a very pleasing card back. There is no player photo here, but with this design there really isn't a need for one. Panini did a good job here. The Rookie Jersey Auto cards are numbered after the main 100-card base set. These rookie cards feature a unique acetate window for the signature. Panini says that the reason for this was to avoid sticker autos. They had each rookie sign a large acetate sheet for these specific cards. As these cards were produced at the beginning of the season, it was hard for Panini to have these ready for signing on-time. I personally think these acetate signatures were a genius move on their part. I definitely prefer this to the sticker. 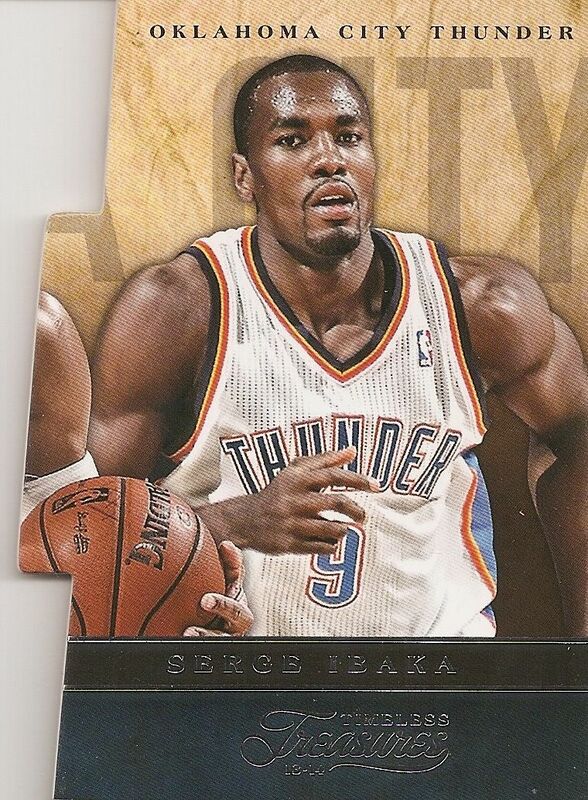 Also, unlike previous years, the rookie cards now have a piece of player-worn material embedded in the cards. These are not game-worn materials, but this is better than having fake leather or nothing at all. The Timeless Treasures rookie cards have stepped it up! The box states that it will contain two autographed cards and a memorabilia card along with the base card. Timeless Treasures also offers collectors insert cards as well. One of the interesting insert cards to pull from Timeless Treasures are the Three-Piece Puzzle cards. As you can see, you can collect all three pieces to form one themed puzzle. It's a fun idea, but one that puzzles (get it!?!) me with this product. With the price of Timeless Treasures being around $100 per pack/box, telling collectors to 'play with' their cards in this way doesn't make a ton of sense. I would think most collectors would try to keep cards from this mid/higher-end brand in as good of a condition as possible. Getting all the cards put together could damage corners and edges. There are rare parallels of these cards that go all the way down to a print run of just 1. Try to get that triple puzzle put together! Validating Marks is an insert set that features sticker autographs. 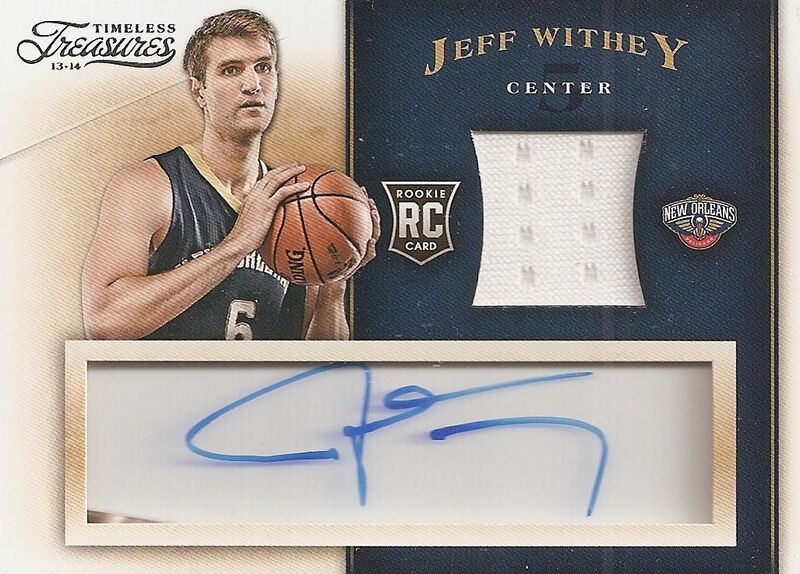 It's your typical autographed card found in products such as these. They aren't terrible cards, but they are not exciting pulls unless you happen to get a real big name player. That being said, these Validating Marks cards are very clean and have a good-sized space for the autograph. As with many sticker autographs, problems can arise such as autographs being cut off. 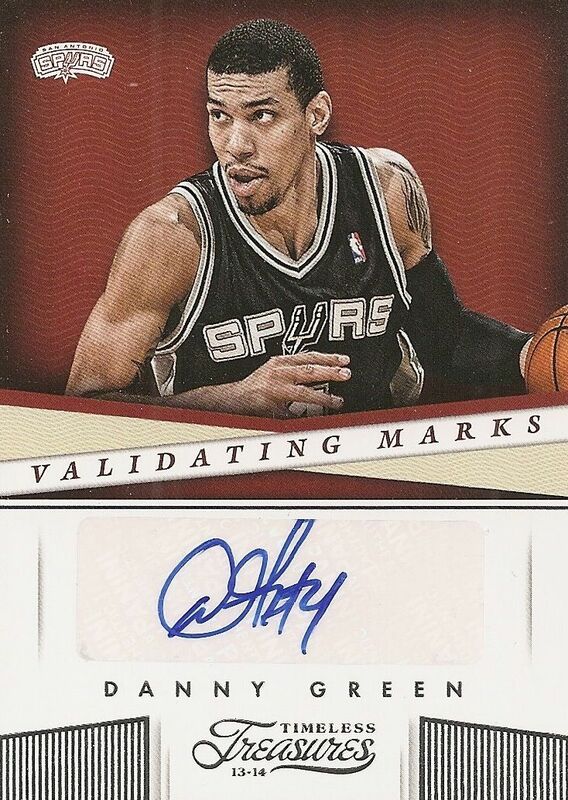 The Danny Green shown above has a bit of his signature cut off the top. That's one of the reasons why collectors prefer on-card autos. My one memorabilia card (besides the rookie jersey) was a big one. This Every Player Every Game one-of-one tag card was a HUGE pull. Obviously a card like this will not come out of every box... or even case of Timeless Treasures, so I won't base my final assessment of this product on it, but it's good to know that ridiculous cards like this can be pulled from this product. 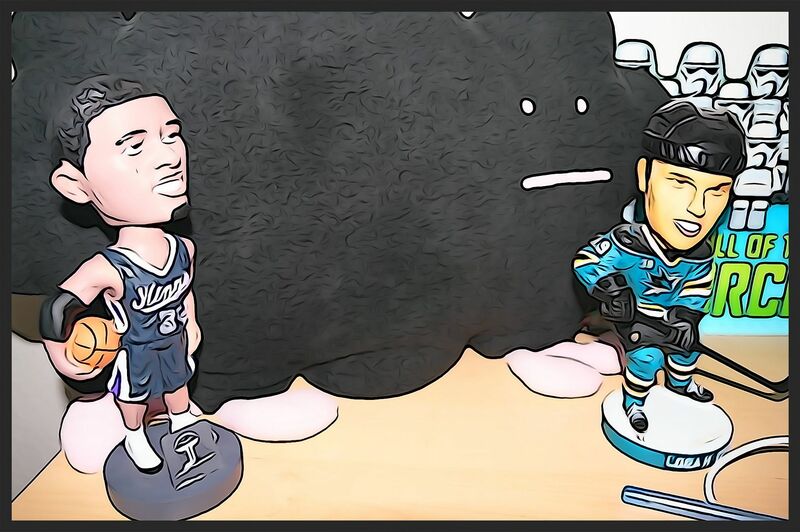 99% of the time collectors will probably pull regular jersey cards, or if they're lucky, a patch. This Chris Paul is stunning though! I could not believe it when this card came out. It looked so good I thought it might have been a manufactured patch! Loving this card! 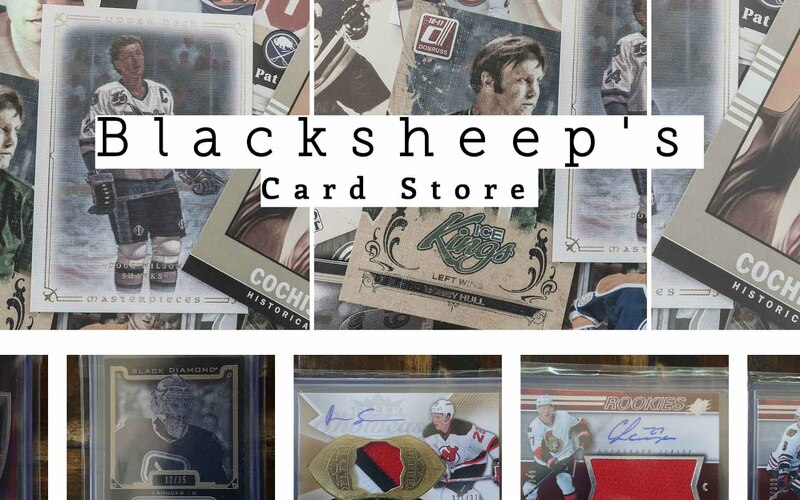 One box of Timeless Treasures will in no way give you an idea of all the cards you can pull from the product, but know that there is a great deal of different inserts, memorabilia, and autograph cards to be found! Timeless Treasures is a very solid offering this year. It has improved by quite a bit from what it had been in the past. I really like the fact that you can get two autographs and one memorabilia per box, and especially nice is that the autograph comes on acetate with a piece of player-worn material. I know that I got a crazy pull from this box, and that most boxes will not yield such a hit, but I definitely would recommend giving Timeless Treasures a try this year. Collectors who have tried it in the past will find that it has stepped up. Three hits for about a $100 is asking a bit much. This is not a cheap product, but wait a few months and it should come down to a more affordable level. I'm really happy to see the direction that Timeless Treasures is heading. It's exciting to see Panini changing their products in ways that make them more collectible! Amazing pull on the Paul! I pulled a 1/1 yellow printing plate of his in a 2005-06 Topps Total break years ago. As for your question about the tin, yes, this product used to come in tins. I broke one a couple of years ago for Trader Retreat. These cards are tiiiiiiight, nice look to them! Reminds me of Limited hockey but better b/c of the acetate see through autos instead of the bs manufatured cloth that bleeds the autos too much. Amazing product. I love the see through auto I hope they put that into hockey. 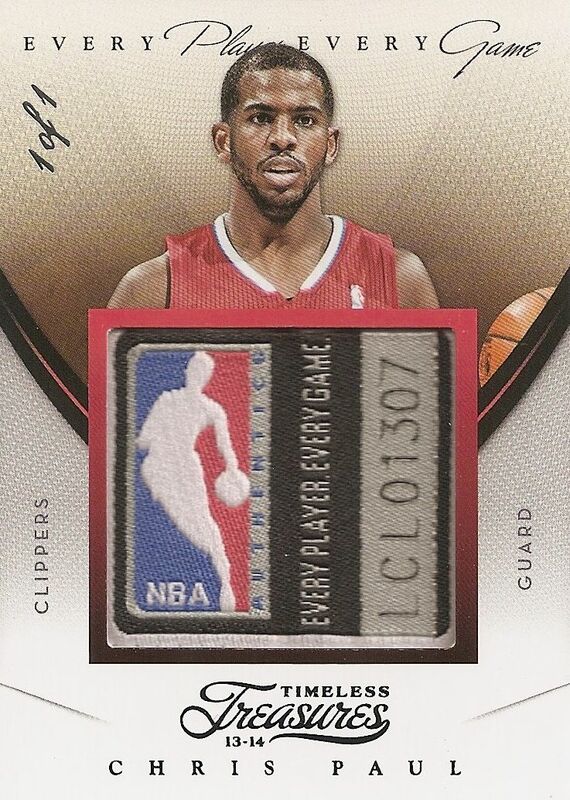 Beautiful Chris Paul I mean when you can pull a top 15 player in the world 1 of 1 tag out of a product like this wow simply wow. Go buy a lottery ticket haha..
UNREAL RESULT ON YOUR BOX! WOW! CONGRATS, BUD!! You totally deserve it! Wow sweet break, the CP3 is an absolute monster. Great thorough review as well. I am liking this years product more than that of last years with the tin. Seems to me to be a lower end cheaper version of a product like Immaculate. I think they in a way mixed a few products together for the design but I like it. The acetate is a novel idea, reminds me of the patch autos in UD Black Hockey that had the acetate window. That said the execution from Panini has been mixed, I've seen a few with the top or bottom half of the auto disappearing behind the card. + Smaller box means less wasting of natural resources. It's pretty cool looking as well! + Great cards can be pulled out of Timeless Treasures! - I don't get the idea with an acetate room for the autograph? - From such a high end product you store your cards in top loaders for example, not puzzling and gluing them up together, or what Panini was thinking? - The prize is maybe a bit to high for that few cards. love it man! Keep it up! These cards look Hi-Def! Great job Panini. Great hit the one of one but i personally don't enjoy one pack products. Still a nice one. Holy s**t that is a Great pull ! I think that timeless treasures is a very good product. 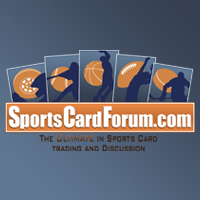 I am a big fan of those accetate cards! I love the design of all the cards in this set. I probably would get a box but it is to expensive for me.